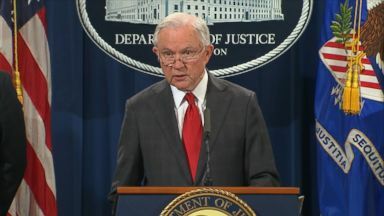 Reporter: The frightening deliveries of explosive devices and the nationwide search for the person who sent them ended with an arrest in Florida. These terrorizing acts are despicable and have no place in our country. Reporter: Authorities say they have the person in custody who went through all this effort to mail ieds in these yellow envelopes to prominent figures in the democratic party. Suspect at the auto zone -- Reporter: Investigators say a fingerprint led them to 56-year-old Caesar sigh yok, arrested at 10:30 this morning in the parking lot of an auto zone in plantation, Florida, outside ft. Lauderdale. Witnesses say they gave up without a fight. It almost seemed like he knew he was going to get caught, so get in with no problem. He had that look of, okay, it's over. Reporter: Federal investigators tonight are describing him as a domestic terrorist with a political chip on his shoulder. The windows of the white van that police say he had parked outside were covered with potential evidence. The hard to miss political messages supporting the president and demonizing his critics, including Hillary Clinton and CNN. He's been charged today with five federal crimes, including interstate transportation of an explosive, illegal mailing of explosives -- Reporter: He already has a past criminal record, and if convicted of these crimes, could face up to 48 years in prison. His arrest comes after four more packages of improvised explosive devices that were discovered just today, a total of 14 explosive devices in all put in the mail to Americans who criticized president trump or have been the constant subject of the president's anger. Each device consisted of roughly six inches of pvc pipe, a small clock, a battery, some wiring, and what is known as energetic material. These are not hoax devices. Reporter: The very first package was discovered Monday afternoon at the home of democratic philanthropist George Soros in a suburb north of new York City. Late Tuesday night, another device this one sent to Hillary Clinton, caught by the secret service before it reached her home in New York. Just hours later, a third package in Washington, D.C. That stopped before it was delivered to the home of president Obama. The package was found at a screening facility located in Washington, D.C. Reporter: Then Wednesday morning in New York City, CNN was reporting on the story when it hit home and alarms went off in their newsroom. To have projectiles, that's a -- That sounds like a fire alarm, we'll keep you posted on that. Reporter: That device addressed to former FBI director John Brennan. Another package meant for California congressman Maxine waters. In Florida police rushed to the office of democratic congresswoman Debbie Wasserman Schultz. The device there addressed to former attorney general Eric Holder but it had Wasserman Schultz's return address. Authorities don't believe she was in any way associated with this. Wednesday night two more packages, this time addressed to former vice president Joe Biden, both caught at postal facilities. The tenth package for actor Robert de Niro. Approximately 6:30 A.M., NYPD bomb squad removed the device -- Reporter: More in the mail this morning, an 11th package recovered near opa-locka, Florida, addressed to senator Cory booker. Another package addressed to former director of intelligence, James clapper. On the air, clapper cut to the point. This is definitely domestic terrorism, no question about it in my mind. 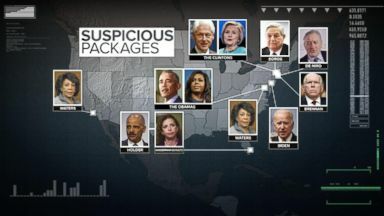 Reporter: In California, a 13th package recovered in Sacramento, addressed to senator Harris. We have determined this device was a legitimate device. We have now rendered the device safe. Reporter: The 14th package addressed to well fair activist and Democrat Tom Stier, stopped at a mail facility in Burlingame. Showing officials what to look for. It was taken very seriously. Reporter: The big break that led to sayoc was a fingerprint, as investigators took apart the crude ied addressed to congresswoman Maxine waters. Once I know they had a precipitation, I was pretty confident we'd be able to find the right person. Reporter: Investigators ran the prints and found a match, Caesar sayoc, whose fingerprint was in the system because of previous arrests including one for alleged 2002 bomb threat. Once they find something like a fingerprint or even partial print, that gets put into their database which contains other fingerprints from previous arrests, which is apparently how they were able to make the match. 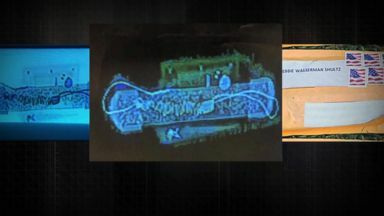 Reporter: As police recovered more devices, the evidence kept pouring in. Once they could say who he was, they used his cell phone to track him. This is phenomenal work with the greatest pressure under an incredibly tight time frame. We see unbelievable work like this on TV and in Hollywood. But to see it up close in reality is something to behold. Reporter: We're now learning more about the suspect, Cesar sayoc. His family attorney says he was living out of his van and says his former client wasn't violent, but suffers from mental illness. Although we don't know the alleged bomber's exact motivations, new details about his personality are coming in. It was almost like there were two caesars. I don't know how to describe it. There was the -- you know, the articulate, dependable, the reliable. Then there was this one that spewed awful, vile, ungodly things. Reporter: Deborah, his former boss at a pizza restaurant, describes him as a reliable employee but says he is outspoken opinions were often a problem. I didn't like him as a person. I mean, because it offended me with what he was saying about me. Gays, blacks, Jews, hispanics. He loved Adolf hitler. His van, what you saw was what you got with his van. It was always Ku klux Klan, or naziism. Reporter: There are certainly other clues that point to extreme politics. He was one of those people on Twitter constantly posting dislike for the Clintons, Obamas, and other Democrats. He may have been a part -- appears to be a partisan. But that would be determined by the facts as the case goes forward. Reporter: Sayoc posted videos like this one on social media that appear to show him at trump rallies. They're going to look at any type of event, any type of function that he went to. Particularly if it was some type of political event or a campaign event. They're going to try to see, was he there with certain people? Reporter: Today the president condemned what he called political violence. We must never allow political violence to take root in America. Cannot let it happen. And I'm committed to doing everything in my power as president to stop it. Reporter: Wednesday night in Wisconsin, he urged for all sides to come together. We want all sides to come together in peace and harmony. We can do it. Reporter: By the president's own account he was on his best behavior in the immediate aftermath of this incident, but we have seen some significant backsliding. Overnight the president once again attacked the media, tweeting, funny how lowly rated CNN and others can criticize me at will, even blaming me por the current spate of bombs, and ridiculously comparing this to September 11th and the Oklahoma City bombing. Yet when I criticize them, they go wild and scream, it's not presidential. Later he wrote, Republicans are doing so well in early voting and now this bomb stuff happens and the momentum greatly slows. News not talking politics, very unfortunate. Today reporters questioned the president about his recent remarks. No, not at all, no. Not at all, no. There's no blame. There's no anything. If you look at what happened to Steve Scalise, that was from a supporter of a different party. Reporter: When asked if he would tone down his rhetoric? I think I've been toned down, if you want to know the truth. I could really tone it up. As you know, the media's been extremely unfair to me. How? And the Republican party. How? At moments of national crisis we've become used to a president who seeks to unify. President trump does not have that instinct. He is by his nature someone who plays on the divisions, not the opportunities for unity. Reporter: Even though police say there's a suspect behind bars, authorities say this may not be over. Today's arrest means new yorkers and people across our nation are safe, but as director ray said, there might be more packages out there, so everyone needs to take caution. Reporter: When checking the mail, it's safety first. For "Nightline," I'm Steve osunsami in plantation, Florida. 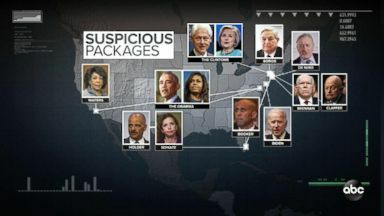 Sayoc is charged with five federal crimes, including interstate transportation of an explosive, illegal mailing of explosives and threats against a former president, Attorney General Sessions said. 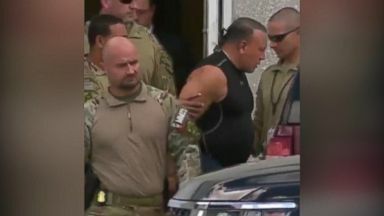 Cesar Sayoc was taken into custody Friday. The Florida man was taken into custody for an apparent mail bombing campaign. How Investigation Into Suspected Mail Bomb Campaign Is Unfolding; What's Next For Megyn Kelly? "Nightline" takes a look at how authorities are working to find who tried to hurt public figures across the U.S.